As a parent of two students and co-founder of GO Oakland’s United Families Building Community, I am committed to inform parents about ways to navigate our school system so that more families can advocate for their children and all of Oakland’s children. This spring I co-facilitated a workshop on A-G requirements. A-G requirements are courses high school students are required to take and pass with an A, B, or C in order to be eligible for entrance at a UC or CSU colleges. 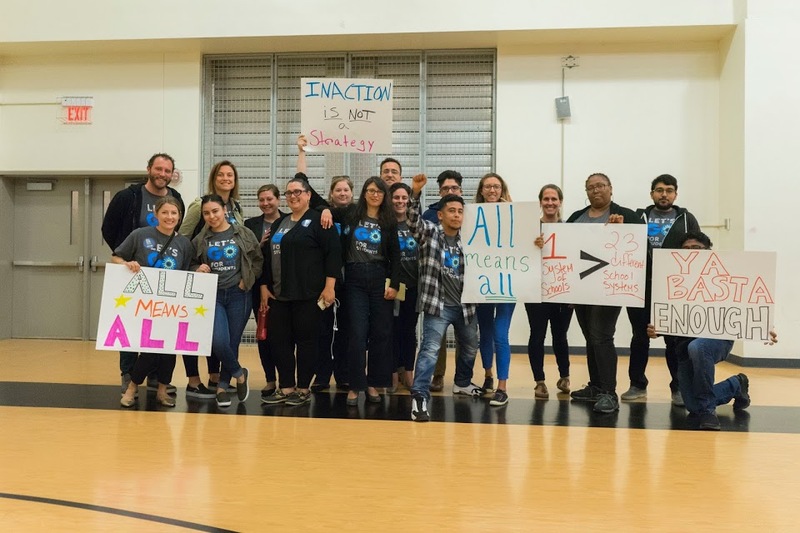 According to OUSD’s A-G Completion Dashboard, in 2016, 51% of OUSD’s 12-grade graduates met their A-G requirements and only 34% of African American graduates, 37% of Pacific Islander graduates, and 53% of Latinx graduates met the A-G requirements. 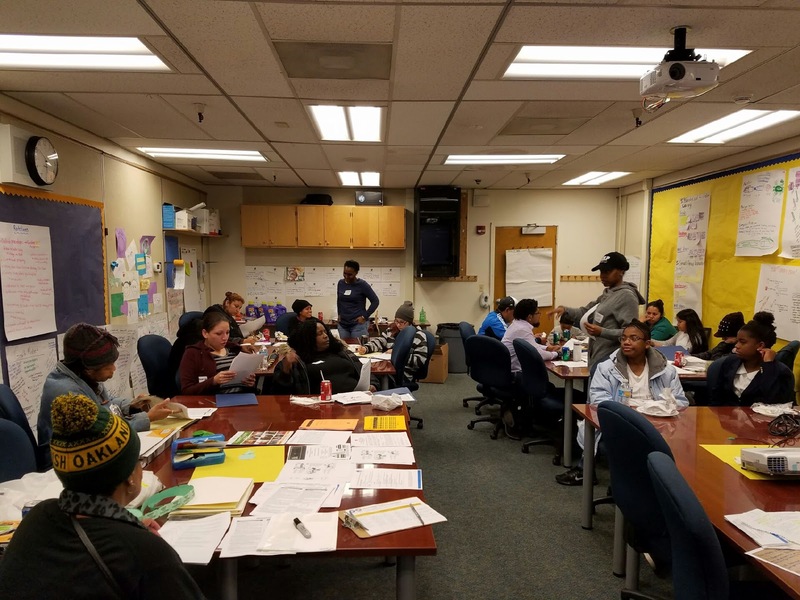 So we partnered with OUSD staff, McClymonds High School’s leadership, and Alternatives in Action staff to gather accurate information and resources for West Oakland families. Over the period of 3 weeks we trained more than 35 families from McClymonds High School, West Oakland Middle School, Lafayette Elementary School, and Hoover Elementary School about the importance of preparing their child for graduation and college and how they can begin to do this now by making the best decisions that shape their child’s future. Many families were not aware of the courses students need to take to keep them on track to graduate and go to college. We gave them an example of a 4-year plan to complete A-G requirements. You can download and print the 4-year plan by clicking here. 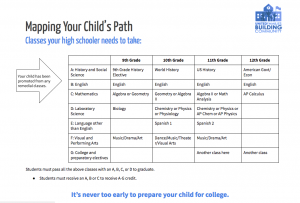 This chart provides families with an visual representation of the courses students would need to take throughout their high school career, however, we strongly advised all middle and high school families to meet with their child’s academic counselor to make sure they have taken the required courses and tests such as the SAT and ACT to be on track to graduate and go to college. The choices you make now will impact the choices your students will have in the future. If your student receives a grade of a D or an F any class, especially an A-G course, they should retake the class immediately in summer school, community college, or through online courses offered by some OUSD high schools. Advanced Placement, A.P. and Honors courses expose students to more advanced courses and might provide other benefits including providing students with college credits before they graduate high school. We recommend you sit down as a family and consult with your academic counselor to determine if some of these courses are the right choice for your student. The A-G classes are minimum requirements that don’t guarantee entrance into college. Your students need to aim high and receive the highest grade possible because college entrance can be very competitive. Participants shared that they found the information detailed and informative. I hope you find this information useful as well.